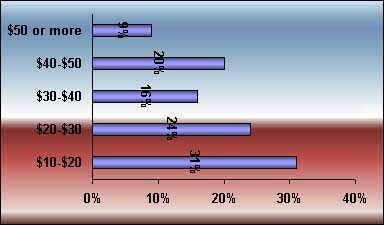 In March 2006 we conducted a Poll amongst the subscribers to our highly regarded Project SafeCom News and Updates. Our Newsletter has been an uninterrupted service since the beginning of 2002 for Human Rights advocates, lawyers, migration agents, journalists and reporters, students and academics. The News and Updates has has a popular service ever since we started it, and we always regarded as a 'subscription-free' service. We never expected anything in return, even while we can reasonably expect from subscribers that they contribute financially to Project SafeCom. Then the time came we wanted to measure how our subscribers valued the Newsletter. What annual value do you place on your personal subscription to the Project SafeCom Newsletter, the News and Updates, based on its current performance, frequency and contents? Subscribers were given five monetary value choices to choose from in their responses: $10-$20, $20-$30, $30-$40, $40-$50 or more than $50. They were also welcomed to provide comments in the Comments box on the web-based survey form page. While the sample (55) of those who completed the Survey was relatively small, representing about 10% of all subscribers, it can be regarded with relative confidence as a sample cross-section of all subscribers, even while one respondent reminds us in this context: "Worth keeping in mind that polls like this tend to elicit undervaluations". The table below, as well as the table at the top of this page, shows the graphs of the Poll results. Note that we carefully use the phrase "chose the radio button". We asked you to place an annual value on the newsletter, we took care to not ask you to commit yourself to paying the amount of money you chose in the Poll. "It's a loaded question. Value has many meanings, not just monetary and it's also about the ability to pay subscription fees. Choosing the lowest figure you have provided merely reflects my own financial state, not the "value" placed on the work you are doing." "I think the value, and what I could actually afford to pay are two different things! I would probably pay $10-$20, although the value would be $40 -$50." These remarks are helpful, because it's tempting to oversimplify the Poll results and to argue that because 31% of subscribers choose the $10-$20 range, "most subscribers" would pay that amount: it's good to know that this is not what we tried to measure. That's why the mean value (X) and the Standard Deviations are provided in the table below - and explained. ... the average value subscribers put on the Newsletter was $30. ... most subscribers choose a dollar amount up to $13 away from the $30 average: between $43 and $17. 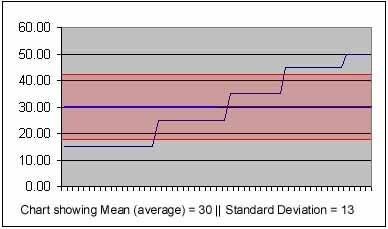 The average is the blue horizontal line, and the range of the Standard Deviation is the red shaded area above and below the blue line. "I believe it is extremely valuable however I could not pay more than say $40 due to a student's strict budget." And someone who chose $10-$20, comments: "I certainly value The Project SafeCom newsletter - it is most informative and gives access to articles that I would not otherwise see. I probably would pay $30 if I had to!" "I wish I was rich - my group is really down to about ... well ... one person (me), but if I can't afford a piffling $50 a year to keep you doing what you're doing, there's something amiss!" "I can't put an 'annual value' in dollar terms on the Project SafeCom news (which I find extremely useful), but would be willing to pay an annual subscription fee of between $30 and $40." "It is an excellent resource - but not knowing how much it costs, then not sure if my donation is covering cost adequately - perhaps you could suggest a donation level - a basic figure to at least keep the newsletter going..."
"I work with detainees. Your newsletter is essential, for me to get the 'alternative perspective'. However, my workplace would never pay for the subscription." "Love the compilations and (usually) even mix of serious and humourous news. Would support having a sliding scale subscription fee based on an honour system reflecting income. Thanks for the hard work that makes it easier for us to keep up with the important stuff." "I suggest asking all subscribers to make an annual donation of between $10 and $50 and keep it as a donation thing." "I read every issue - this is an invaluable resource and my own research would be much more difficult without it. Many thanks for all the work you have already done all these years. I would be very happy to pay a subscription." "I find the media round up of refugee issues very helpful - it picks up the reports I've missed!" "I depend on Project SafeCom's info as well as other sources for the basis of letters to politicians." "I find the newsletter invaluable in relation to my work as a union organiser." "As an expatriate Australian permanently resident in Norway I use your site to keep up to date with the Australian approach to an issue which is also controversial in Norway and as well the entire EU. I appreciate the breadth of opinions published on your site ... Thanks for keeping me informed in the past. I hope you continue to prosper." "Great newsletter, keep me up with human rights issues." "Reliable and timely coverage of the asylum and refugee and human rights issues which I want to track. Project SafeCom has helped to marshall people power via the internet - a great contribution to democracy." "I think the Project SafeCom news updates are very focused and helpful for keeping abreast of developments in human rights issues in Australia. Definitely worth supporting." "While I get a considerable amount of news in the Sydney Herald, it is great to get articles eg. Tony Kevin and Julian Burnside drawn to my attention. The country is in grave danger from the present policies of the Federal Government. Apathy will destroy us as a free nation." "Really value the information I get from the newsletter. Though a lot of it makes me even more angry than I am already, I appreciate getting to the truth. It's a pity that not more is revealed in the general media." "I've been reading you for ages because of my intense interest in the refugee issue. I started because I am commencing a PhD study of the media's depiction of asylum seekers."